Examples, solutions, videos, worksheets, games, and activities to help Algebra II students learn about arithmetic series. 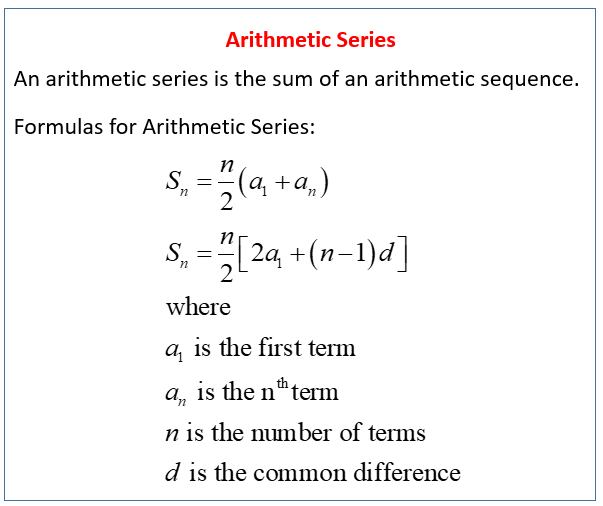 What is an Arithmetic Series? An arithmetic series is the sum of terms of an arithmetic sequence. What are the formulas to find the nth partial sum of an arithmetic sequence? The following diagrams give two formulas to find the Arithmetic Series or the nth partial sum of an arithmetic sequence. Scroll down the page for examples and solutions on how to use the formulas.